Vancouver, British Columbia--(Newsfile Corp. - May 17, 2018) - Thunderstruck Resources Ltd. (TSXV: AWE) (The "Company" or "Thunderstruck") is pleased to announce that field operations are well underway on its 100% owned high grade zinc, copper and gold assets in Viti Levu, Fiji. The present work is building on extensive prior results that point to the potential for large mineralized systems. "Our exploration season is now in full swing, and we have initiated multiple exploration activities across all of our four primary assets," commented Thunderstruck's President and CEO Bryce Bradley. "A detailed mapping program of Rama Creek has begun which will follow up on the recent Senikura gold zone discovered nearby. Concurrently, road building into Rama Creek should be completed by the end of May, making it easier to get larger rigs onto the property later in the season. In addition, preliminary mineralogical tests from our Wainaleka VMS project indicate great potential to produce zinc and copper concentrates via conventional flotation, which is a critical precursor to mine development." "Elsewhere, further work on our high-grade Liwa Creek gold prospect will begin shortly, and we'll be giving all of our zinc, copper and gold assets much deserved attention this season, with plenty of news flow forthcoming. This is the first year that Thunderstruck has had the entire land package under its control and can meaningfully advance the various targets. The enthusiasm around this program has prompted investors to request a private placement, at above market, which we have agreed to." During December 2017, field crews carried out a soil program to determine the limits of the broad copper-gold (Cu-Au) mineralized porphyry intrusive at Rama Creek. Originally discovered by Anglo American in the 1970s, subsequent work, including drilling and trenching, outlined a broad porphyry system. The recent work was successful in establishing a framework of porphyry hydrothermal alteration zonation that is helping to understand the geometry of the system and will serve as a vector to define the core of the mineralized system. Field crews collected a total of 112 ridge-and-spur auger soil samples that were subsequently submitted for gold and multi-element geochemical and TerraSpec® Short Wave Infrared (SWIR) spectral analysis. Of the 112 auger soil geochemical samples collected over the interpreted extent of the Rama Creek Porphyry, a total of 18 samples returned greater than 50 parts-per-billion (ppb) Au and up to 0.76 grams-per-tonne (g/t) Au; and a total of 31 samples returned greater than 500 parts-per-million (ppm) Cu and up to 0.56% Cu. In conjunction with a previous 126 targeted auger soils collected by the Company, an 18-sample subset of which yielded an average of 0.27% Cu and 0.15 g/t Au (see the Company's March 1, 2018 News Release), the current soil samples define an approximately 1,000 x 600 metre (m) greater than 200 ppm Cu in soil anomaly containing a northwest elongate 500 x 300 m greater than 50 ppb Au in soil geochemical response coincident with the inferred centre of the Rama Creek intrusion (Figures 1 and 2). TerraSpec® SWIR spectral analyses define a sericite (white mica) alteration halo that is coincident with the plus-200 ppm Cu in soil geochemical anomaly. The plus-50 ppb Au geochemical target is associated with a northwest elongate magnesium-chlorite spectral response. Gold in soils exceeding 100 ppb (six samples in total) are coincident with a 300 x 200 m area of higher-temperature potassic (magnesium-iron chlorite + biotite) alteration containing historic Australian Anglo American Ltd (Anglo) diamond drill hole "DDH1" that returned a 244-metre interval between depths of 6 and 250 m averaging 0.22% Cu, ending in mineralization (Figures 1 and 2). The results of the soil geochemical and SWIR spectral analysis program were successful in defining a near-surface expression of porphyry Cu-Au mineralization at Rama Creek. The application of modern SWIR spectral analysis in particular has added critical evidence of porphyry hydrothermal alteration zonation comprising distal weak to moderately chlorite-pyrite altered diorite intrusive and host volcanic rocks, to pervasive proximal sericite and core zone potassic altered porphyry intrusive. The subsurface geometry and depth extent of the Rama Creek Cu-Au porphyry has not been determined. Historic drilling by Anglo has shown disseminated Cu-Au mineralization extends to a vertical depth of at least 250 m, and is open at depth and in all directions. 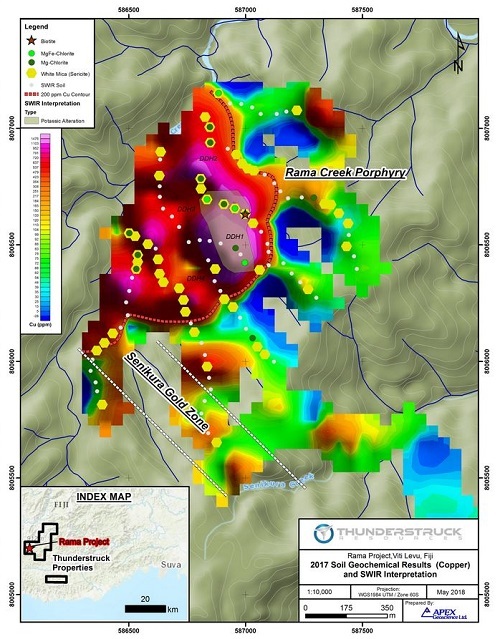 In addition to the Rama Creek Porphyry Cu-Au target, the recent soils samples have provided additional resolution on the Company's emerging Senikura Gold Zone target that returned trench rock channel sample results averaging 0.96 g/t Au over 11.1 m (38.5 to 49.6 m), within a broader anomalous gold zone averaging 0.55 g/t Au over 37.6 m (12 to 49.6 m). At a distance of 700 m to the northwest, a series of 10 auger soils spanning the southwest contact zone of the intrusion returned anomalous gold values averaging 0.063 g/t Au (63 ppb Au), including two samples returning 0.1 and 0.2 g/t Au (see the Company's March 1, 2018 News Release). 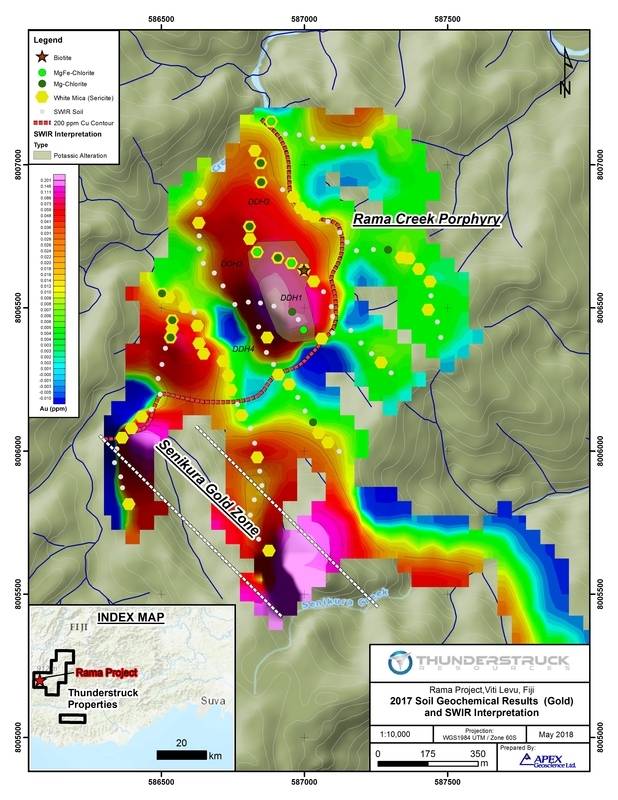 Together these two gold occurrences define an apparently northwest trending gold zone along the margin of the Rama Creek Porphyry that is open to the northwest and southeast into the headwaters of Senikura Creek. Moving Forward, the Company has commenced road rehabilitation and construction to establish vehicle access to the Rama Creek Prospect in support of 2018 field programs. 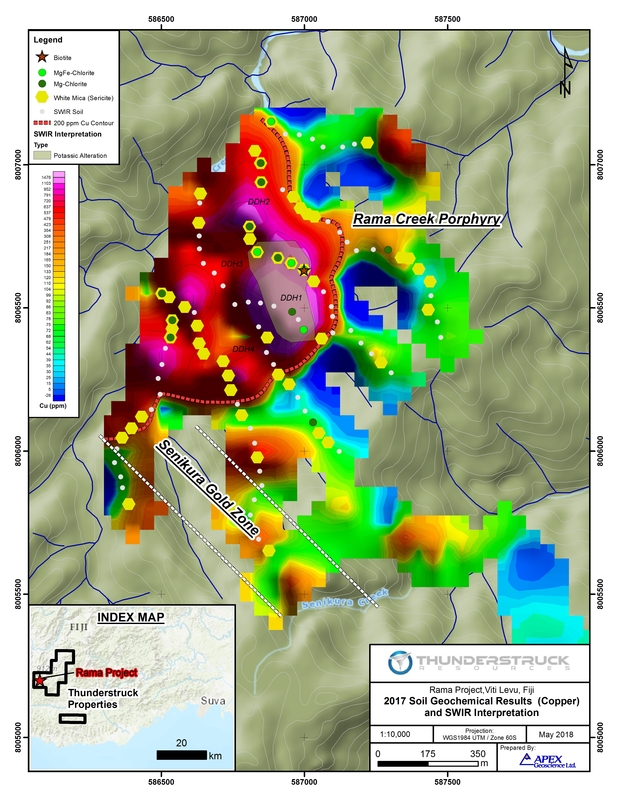 The present program will include additional Bulk Leach Extractable Gold (BLEG) stream geochemical sampling in the headwaters of Rama Creek to the northwest of the Rama Porphyry and the potential strike extent of Senikura Gold Zone; an expanded auger soil geochemical program designed to test the southeast extent of the Senikura Gold Zone; follow-up on an historic Senikura East gold in soil anomaly located a further 1.5 km to the southeast (12 consecutive 100 m spaced auger soils over 1.2 km returning an average of 67 ppb Au) (see the Company's March 1, 2018 News Release); detailed geologic mapping, prospecting; and Induced Polarization (IP) / Resistivity geophysical surveys towards modelling the subsurface geometry of disseminated Cu-Au bearing sulphide mineralization and generation of finalized diamond drill targets. During March 2018, the Company engaged SGS Canada Inc. (SGS) to complete a QEMSCAN (Quantitative Evaluation of Minerals by Scanning Microscopy) study on a selection of 10 polished mineralized samples from the Company's Wainaleka Zn-Cu VMS (Volcanogenic Massive Sulphide) deposit. The purpose of the QEMSCAN study was to provide information on modal mineralogy, grain size and to provide a preliminary guidance with respect to potential metallurgical performance. 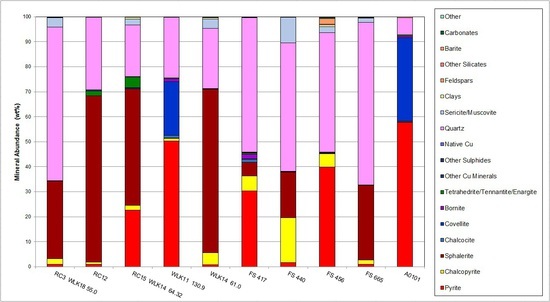 QEMSCAN results (Figure 3) for the 10 samples show a range of sulphide mineral content, with sphalerite, covellite and chalcopyrite being the main minerals of interest. Other sulphide minerals include pyrite, bornite, tetrahedrite/tennanite/enargite, and chalcocite. The 10 samples contained an average of 26.3% modal sphalerite (ranging from 0.1% up to 66.5%); an average of 4.2% chalcopyrite (ranging from 0.1% to 17.9%); and 20.6% pyrite (ranging from 0.9% to 57.7%). Significantly, two samples (RC22 and A0101) collected at a depth of approximately 131 m within drill hole WLK-11 contained 33.3% and 21.4% modal covellite. Sequential floatation of copper, then sphalerite into separate concentrates was recommended as a potential processing option for the majority of samples. High zinc content of two samples (greater than 65%) may make them a good candidates for pre-concentration using either dense media of gravity separation. Particle size observed is similar to typical VMS deposits, and suggests a primary grind size of 75 to 100 micron (0.075 to 0.1 mm) should be targeted. With respect to deleterious elements, the observed quantity of non-sulphide gangue minerals should not negatively affect metallurgy. Several reagent schemes and processing conditions can be evaluated to limit recovery of pyrite and arsenic bearing minerals observed in a minority of samples. In addition possible use of zinc depressants, and avoiding blending of high covellite and high zinc or zinc-copper material to limit the potential for high-zinc copper concentrates is suggested. The Company is encouraged by the results of the preliminary QEMSCAN ‎mineralogical study, which shows the Wainaleka Zn-Cu mineralization appears to have an overall coarse sulphide distribution, making it amenable to sequential flotation. Importantly the study raised the possibility of the creation of a zinc concentrate by relatively low cost dense-media or gravity process methods. Other important mineralogical observations that warrant further study include: the presence of a subset of high modal percent covellite samples; potential interaction of pyrite in copper primary mineralization; and the presence of a small percentage of copper-antimony-arsenic minerals. In future, the Company intends to investigate various flotation and gravity separation methods, grind size, and reagent (pyrite and zinc suppressor) combinations on fresh drill core samples. The QEMSCAN study represents an important step forward with respect to optimizing subsequent detailed metallurgical studies. These results are extremely significant in that they provide to potential joint venture partners comfort, on an initial basis, that the material could be processed to produce saleable concentrates. During 1977 Australian Anglo American Ltd. (Anglo) completed a 15 hole diamond drill program totaling 1,850 m with holes averaging a relatively shallow 120 m depth that defined the Wainaleka Zn-Cu VMS deposit. Drill hole WLK-1A intersected 9.8 m averaging 8.28% Zn and 1.45% Cu; and drill hole WLK-10 returned 14.1m averaging 1.3% Zn and 1.5% Cu within what has been interpreted as a zone of stringer mineralization. True widths are estimated at 80-100% of the drilled interval. Geologic mapping indicates 15 km prospective geology strike length; including 8 more underexplored Zn-Cu VMS prospects. During 1980, Anglo commissioned Golder Associates to conduct a review of potential mining scenarios of several Fijian VMS deposits including Wainaleka*. The study published an historic, uncategorized resource for the portion of the Wainaleka Deposit that was tested by the initial drilling of 250,000 tonnes grading 8% Zn and 2% Cu. The resources are considered historic in nature and do not meet the criteria for a National Instrument (NI) 43-101 compliant resource of any category and as such should not be relied upon. Thunderstruck has been unable to verify these sources of information. *Source: Golder Associates, Review of the Mining Potential of the Fijian Kuroko Style Mineral Discoveries, 1980. The Company has arranged a non-brokered private placement to raise up to $150,000 through the sale of up to 1,666,666 units at a price of $0.09 per unit (the "Financing"). Each unit will comprise one common share and one share purchase warrant. Each whole warrant will entitle the holder to purchase a further common share at a price of $0.15 per share for a period of 36 months from closing. The warrants will be subject to accelerated exercise provisions such that if the closing price of Thunderstruck's common shares exceeds $0.25 per share for a period of 20 consecutive trading days, Thunderstruck may give notice of the acceleration of the warrants' term to a period of 30 days following such notice. Proceeds of the Placement will be applied to continuing operations on the Company's Fiji properties and general working capital. Thunderstruck Resources is a Canadian mineral exploration company that has assembled extensive and highly prospective properties in Fiji on which recent and previous exploration has confirmed VMS, copper and precious metals mineralization. The Company provides investors with exposure to a diverse portfolio of exploration stage projects with potential for zinc, copper, gold and silver in a politically safe and stable jurisdiction. Thunderstruck trades on the Toronto Venture Exchange (TSX-V) under the symbol "AWE". Kristopher J. Raffle, P.Geo. (BC) Principal and Consultant of APEX Geoscience Ltd. of Edmonton, AB, is a qualified person for the project as defined by National Instrument NI 43-101. Mr. Raffle has reviewed and approved the portion of the technical content of this news release as it relates to the Rama Creek and Wainaleka Prospects. During 2017 all Auger soil samples were submitted to Australian Laboratory Services Pty. Ltd (ALS) labs for gold and multi-element geochemical analysis via aqua-regia extraction of a 25 gram (g) sample with ICP-MS finish. SWIR spectra were analysed by ALS using a TerraSpec® 4 High-Resolution Spectrometer on an approximately 100 g plus 2 millimetre coarse soil separate. Spectral interpretation was completed using AusSPec International aiSIRIS™ (Spectral InfraRed Interpretation System) software to produce raw spectral files and output mineral assemblages and relevant spectral parameters. Auger soil samples were collected at a maximum depth of 2 m or to refusal. Given the reconnaissance nature of the samples, Thunderstruck has relied on the external QA/QC of ALS which included the insertion of insertion of standard, blank and duplicate samples at a rate of 10% into the sample stream to confirm the accuracy of the reported results. QEMSCAN image analysis is able to measure mineralogical variability based on chemistry at the micrometer-scale. It utilizes both back-scattered electron (BSE) signal intensity, as well as Energy Dispersive X-ray Signal (EDS) at each measurement point. QEMSCAN can map many thousands of particles in a polished section to obtain a detailed and statistically robust characterization of the minerals present. It maps the particles based on differences in chemical analysis and can differentiate amongst the various non-opaque gangue present in the ore body.